Is Verizon Communications Inc. (VZ) About to Peak? With domestic wireless markets maturing, is Verizon Communications Inc. (NYSE:VZ) about to peak? The slow growing company has already gained roughly 40% in the last 12 months and has gone near parabolic this year jumping $11 in the last few months. Just how high can this stock go now that it has an enterprise value approaching $200 billion trade? Verizon is a leading domestic telecommunications company with a 55% ownership stake in Verizon Wireless. The company remains in an on-and-off discussion to purchase the remaining 45% of Verizon Wireless from Vodafone Group Plc (ADR) (NASDAQ:VOD). Competition in the sector appears to be heating up again as Sprint Nextel Corporation (NYSE:S) reinvents itself and T-Mobile has become a legitimate fourth player in the sector after finally gaining access to the iPhone. 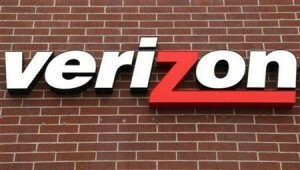 Last week, Verizon Communications Inc. (NYSE:VZ) reported a strong Q1 that pushed the stock to new 52-week highs. While the market loved the news, the company reported a couple of worrisome signs. The amount of wireless accounts and new devices added during the first quarter were basically flat to down with past quarters. Wireline revenue declined by 1.2% as expected and is not considered an issue as long as the pace down is steady. The bigger concern that is the number of wireless retail postpaid accounts dropped, retail net adds were smaller, and wireless 4G devices added during the quarter were the second smallest in the last year. All of these metrics point to a market saturating. With limited new customers in the mix, margins will be squeezed if Sprint Nextel Corporation (NYSE:S) or T-Mobile are successful in attracting away customers. The most encouraging sign is that capital spending was flat with last year allowing free cash flow to soar. If Verizon Communications Inc. (NYSE:VZ) is able to keep capital spending at bay, it will be able to keep the cash flow going. 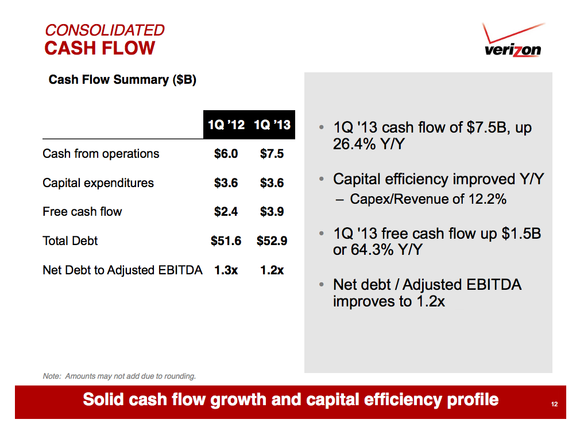 Verizon reported a 64% increase in free cash flow to $3.9 billion in Q1 2013. Last year it only generated $2.4 billion in free cash flow. As the slide below indicates, even with this bullish development the debt load actually increased to $52.9 billion last quarter. This massive debt load is one of the problems with the 3.9% dividend. The company is not being financially prudent by paying that big of a dividend while accumulating debt. Just as Verizon has right-sized capital spending, back come Sprint and T-Mobile as competitive threats. For the last few years, Verizon Communications Inc. (NYSE:VZ) and AT&T Inc. (NYSE:T) had a virtual duopoly as the two smaller wireless providers failed to remain competitive. Now Sprint has turned around with several potential strategic investors. T-Mobile is in the process of merging with MetroPCS Communications Inc (NYSE:PCS) and amongst other stuff now has the much-desired iPhone to offer.